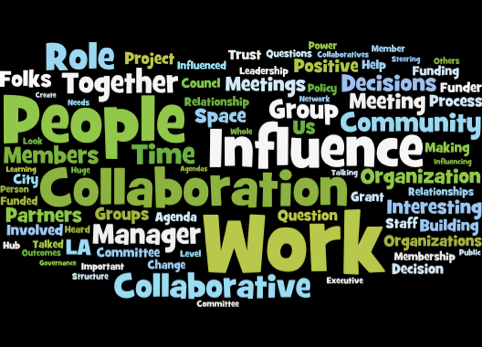 Earlier, I wrote about my research interest in collaborative change initiatives in Southern California, which builds upon my existing consulting practice of serving collaboratives. I’m pleased to share with you experts from my masters thesis, which is something I worked on throughout my two-year masters program in Organization Development at Pepperdine University. 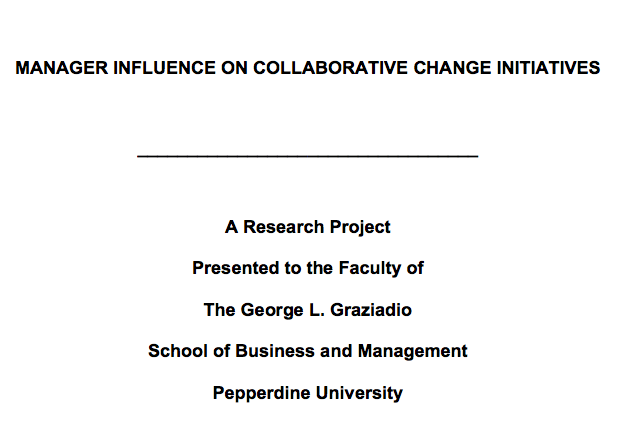 While the existing research gives some general direction for managing collaboration, my thesis aims to uncover the specific influence managers of collaborative change initiatives have in shaping positive outcomes. Specifically, my thesis aims to answer the following question: What influence does a designated and paid manager of collaborative change initiatives have? This research further develops a critical aspect of a growing movement towards collective change-making. With the growing popularity of collective impact, more funders and local leaders are calling for collaborative initiatives to address challenging social issues, sometimes without a full understanding of the complexities, challenges, and frustrations associated with effectively getting organizations to work with each other. An increased understanding of how managers effectively influence collaboration will help increase the overall value of this developing change strategy. 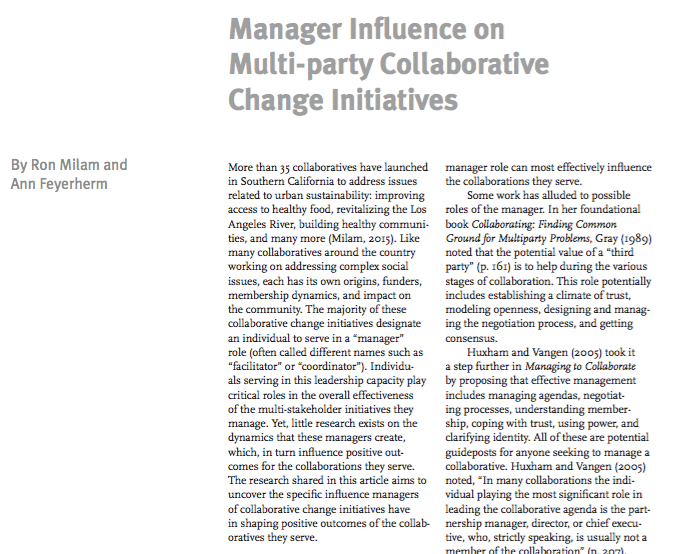 By understanding how one can influence collaboration in a specific role, the intention of this research is to serve as a guide both for managers and funders of collaborative change initiatives. My research generated key themes heard from individuals interviewed for this thesis. The first sections provide two factors related to the context in which managers serve that give them influence, providing the background for the following five areas in which managers successfully influence positive outcomes for the collaborations they serve. Positional Influence: Manager’s Location, Time, and Energy: In many ways, managers serve as a hub for a network of relationships because a key part of their job involves interacting with and building relationships with members of the collaborations they serve. In addition, managers usually spend more time on the collaboration compared to members because it is their job. 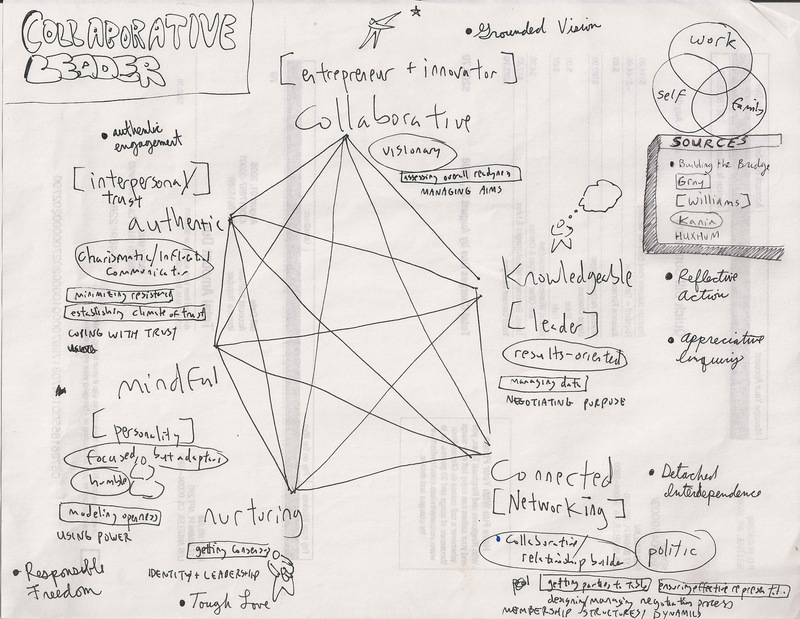 This translates into a deeper understanding and awareness of collaboration dynamics. Contextual Influence: Manager Understanding of Collaboration Dynamics and Environment: A manager is just one of many points of influence within a collaboration, but the managers’ deep understanding of collaboration dynamics helps them both navigate the complexity and influence its direction. 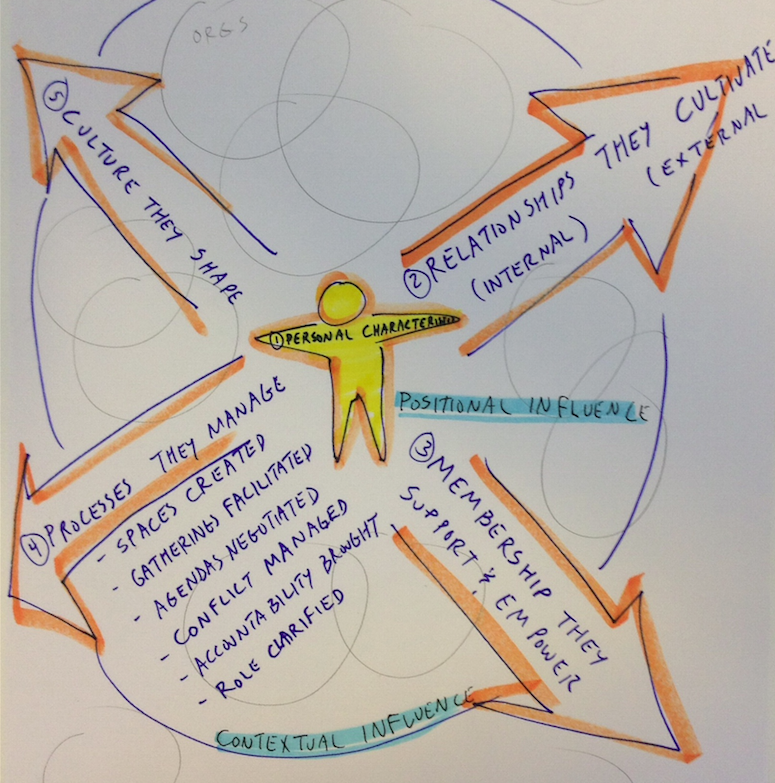 Personal Characteristics and Skills: The personal qualities of the managers shape their ability to influence. The ability of managers to effectively engage with a broad set of stakeholders helps increase their overall influence. Relationships They Cultivate: Managers play a critical role in cultivating relationships, both within the collaboration and with external stakeholders. The quality of these relationships can influence positive outcomes for the collaboration. Membership They Support and Empower: Managers play an important role in providing capacity-building support for members and a space for members to take ownership in the collaboration. The quality of members’ capacity and commitment they bring to the collaboration can influence positive outcomes for the collaboration. Processes They Manage: Managers serve as process stewards for the collaborations they serve. This includes the spaces they create, gatherings they facilitate, agendas they negotiate, conflict they manage, accountability they bring, and their own role that they clarify. Healthy processes that engage members play another key role in influencing positive outcomes for the collaborations that managers serve. 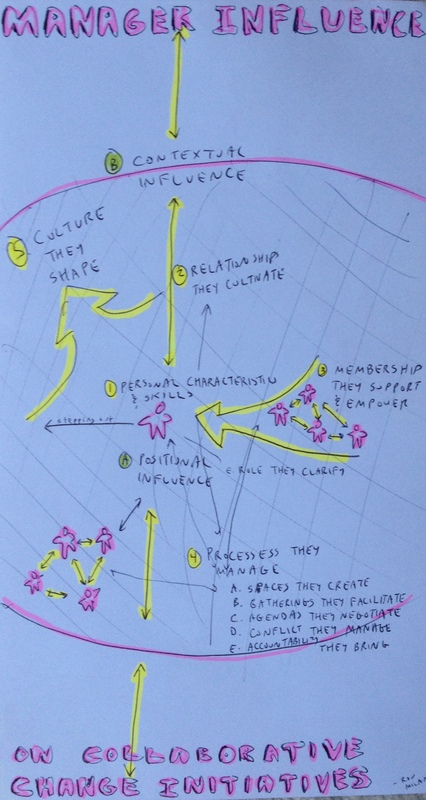 Culture They Shape: What a manager pays attention to helps shape an overall culture of collaboration. Managers use a spectrum of criteria to judge whether or not the collaborations they serve are effective. These findings are based on the number of instances interviewees mentioned various themes based on the coding of the transcripts. Overall, my thesis affirmed many themes found in the existing research. My research added to the conversation by engaging in a dialog directly with managers and funders to reflect on the influence of managers. This research helped identify specific ways in which managers influence the collaborations they serve. The research not only helped clarify, but it demonstrates that managers play a key role in shaping positive outcomes of the collaborations they serve. My research was designed with the practitioner in mind and aims to serve as another guide to best practices for managers serving collaborative change initiatives. Whereas much of the literature focuses on collaboration as a whole, this research looks at the role one individual can play in shaping positive outcomes for the collaborations they serve. This research helped clarify a handful of ways in which managers can influence positive outcomes for the collaborations they serve. In many ways, managers can serve collaborations by functioning as the glue to help keep it all together. The best practices identified in this research—specifically the relationships they cultivate, membership they support and empower, and processes they manage—provide the environment for a collaboration to flourish. Given the agendas that members bring to collaborations they participate in, managers are in a better position to serve as the glue for collaborations they serve. 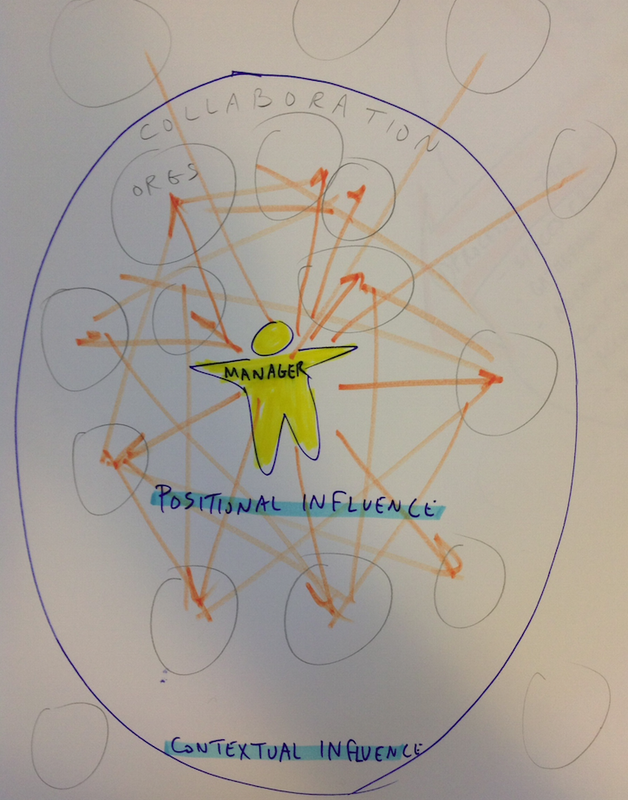 It is hoped that the more managers understand that their influence is not only needed, but is essential for the collaborations they serve, the more they will focus their energies into a set of practices that have the greatest positive impact. For research on collaboration, it is hoped that this thesis begins a new dialog, specifically around influence, that may continue in a number of formats. I found this research to be energizing and am excited to share my findings with the broad array of stakeholders who participate in collaborative change initiatives. If you’re interested in this topic and would like to learn more about my thesis, please contact me. 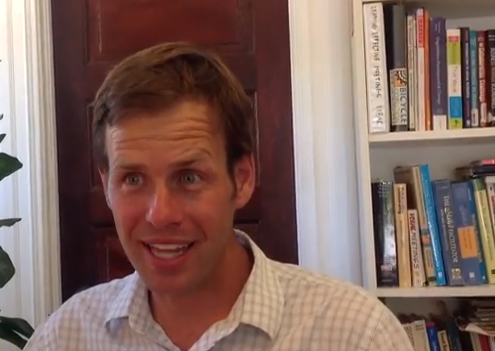 I was also interviewed by a fellow graduate student and invite you to watch a short YouTube video. Two years later, I reflected on collaboration in another interview, this time with Jeremy Grandstaff from S & G Endeavors, one of my Affiliate Consultants I work with. As a consultant, my intention is to serve the leadership of collaboratives to help them reach their full potential while also building my own collaborative leadership throughout the process. I’m in the process of transitioning my consultant practice. Instead of serving 20-35 clients per year, my goal is to serve a handful of collaboratives in a deeper, more impactful way. This would not only include facilitation, but also c0-designing processes and structures that influence successful outcomes. It could also include serving as a strategic advisor to various members in the collaborative space. If you’re connected to any collaborative change initiative and want to explore the possibilities of what this could look like, please contact me. Thanks. I’m pleased to report that since writing this blog post, I’m now coordinating the LA Funders’ Collaborative. This entry was posted in Collaboration and tagged #Nonprofit, Collaboration, Community, Leadership, Organization Development, Sustainability. Bookmark the permalink.